This post comes as part of David Cairns‘ The Late Show blogathon over at Shadowplay. 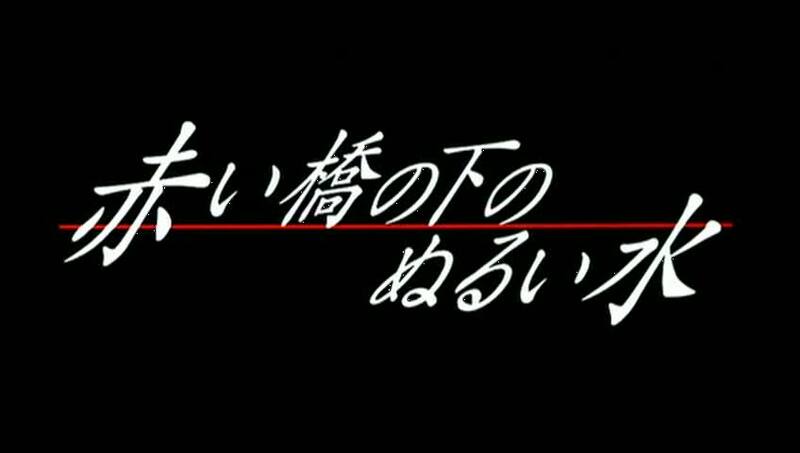 Making its début as part of the main competition of the Cannes Film Festival in the spring of 2001, Warm Water Under a Red Bridge proved to be Imamura Shōhei’s final film, save for a short segment in the portmanteau 11’9”01 September 11 (2002) of the following year, and came in the then-veteran director’s fiftieth year in the filmmaking business. His varied career saw him begin as assistant Ozu Yasujirō, become a key member of the Nuberu bagu (Japanese New Wave), ‘retiring’ into making documentaries after a high-profile box-office flop, before eventually returning to critical acclaim and a record-equalling two Palme d’Or wins. In such a long working life, a number of distinct phases emerge from the whole, the final of which seems to begin after the eight-year hiatus following Kuroi ame [Black Rain] (1989) with Unagi [The Eel] (1997), the Cannes winner with which Warm Water… shares many similarities. Like that earlier film, it takes as its protagonist a man who relocates to a small town to start a new life, though the focus here seems to be on a mischievous sense of mystery rather the murderous melodrama with which The Eel begins. Yosuke (Yakusho Kōji) is an unemployed former salaryman with apparently few prospects for finding a job, much to the chagrin of his unforgiving, nagging wife. When his elderly friend Taro dies, he remembers that he informed him about a valuable gold Buddha he has deposited in a small fishing town many years before, and urges his friend to follow his directions to find it and sell for his own profit. Once there, Yosuke quickly locates the key geographical clue – the red bridge which stands over the river running through the town – and follows the occupant of the house adjacent to it to the supermarket where he is shocked to witnesses two things: firstly, that the woman, Saeko, is depositing items from the cheese aisle into her handbag without paying for them and, more disturbingly, she is somehow leaking liquid onto the floor beneath her. Disturbed, he follows her back to her house where he soon discovers her strange biological quirk, best not described in too much detail here but what comes to be known in the film as ‘venting’, which she may only achieve by either shoplifting or by sexual stimulation. The fast descent into the surreal confirms the film to be what it self-describes as an ‘impossible tale’, and slides into obviously metaphorical whimsy. There follows a rash of Freudian symbolism (signposted by the ‘water’ and ‘red bridge’ of the title) including a strange hallucinatory dream incorporating Yosuke’s entry into to a womb-like state composed of stars (which augments the theme of fertility raised by Saeko’s exaggerated medical condition), repeated flashbacks to Taro’s inane quasi-philosophical ramblings about erectile dysfunction, and another younger character’s obsession with his own ‘precious life essence’. The plotting, after its initial coherence, becomes increasingly scattershot, haphazardly throwing in a visit to a state-of-the-art neutrino observatory, an odd flashback to Saeko’s mother’s water-bound death, more venting, more clumsy flashbacks and some occasional documentary-like shots aboard a fishing vessel. When considering Imamura’s later films, it is perhaps too easy to focus on the negative and what he had lost in terms of his filmcraft by this time. Gone are the obviously strong, central female characters of his 1960s films which, rightly or wrongly, had him labelled as a director of feminisuto (feminist) films, and his famously ‘anthropological’ portrayal of the lower classes of Japan scarcely seen in the respectable canons of Ozu, Mizoguchi and Naruse. Mostly absent too is the strongly observational style, which at their best disintegrated the borderline between documentary and fiction (see the superb Ningen Johatsu (1967)), or showed glimpses of social order in pre-industrial Japanese cultures (Kamigami no Fukaki Yokubo (1968), Narayama Bushiko (1983)). The late-period films seem whimsical and inconsequential in comparison. This insistence on looking back on former glories does the films of Imamura’s late phase a disservice. What is notably different about them is that they feel so much more laidback, less motivated by a reactionary anger, and more upbeat, allowing the comedic side honed by the influence of his mentor Kawashima Yūzō to be shown more fully. Perhaps too, he was calmed by the influence of working with his eldest son Tengan Daisuke, screenwriter here and on The Eel and latterly a collaborator with Miike Takashi (himself a graduate of Imamura’s own Yokohama Vocational School of Broadcast and Film). While lacking the bite of his best work then, what gives Warm Water… its strange charm is this newly-found air of relaxation in the director’s work, the film’s assembly of a small-town world and its population with a host of curious characters – the grandmother who obsessively writes clairvoyant fortune messages all day, the African college student running around the town being tailed by his bicycle-riding, baseball-bat-wielding trainer barking orders at him through a megaphone, the old fishermen of the town, their young rival and his over-exuberant girlfriend – and a host of other minor details and offbeat asides. Perhaps this is not enough for fans of his more ‘important’ films, but Warm Water… does offer a modified version of the director’s eye for the anthropological; Saeko’s ‘venting’ drains out into the river, which sends the local fish and seabirds into a kind-of frenzy and in turn ensures a bumper haul for the local fishermen. If Imamura’s earlier films more directly showed human behaviours to be analogous to those of animals such as snakes, insects and pigs, then what these later films show is a more serene vision, of man as an essential part of the balance of nature. 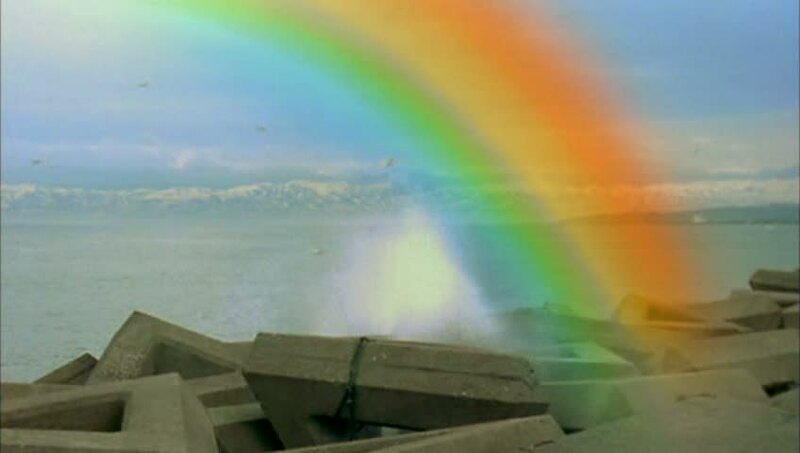 The film’s final shot, though primarily a terrifically funny visual gag, also serves this vision: a superimposed rainbow, apparently caused by a particularly large ‘vent’ by Saeko; an oddly contrived moment of transcendence which closed this great director’s career.